The Sanskrit narrative text Devī Māhātmya, “The Greatness of The Goddess,” extols the triumphs of an all-powerful Goddess, Durgā, over universe-imperiling demons. These exploits are embedded in an intriguing frame narrative: a deposed king solicits the counsel of a forest-dwelling ascetic, who narrates the tripartite acts of Durgā which comprise the main body of the text. 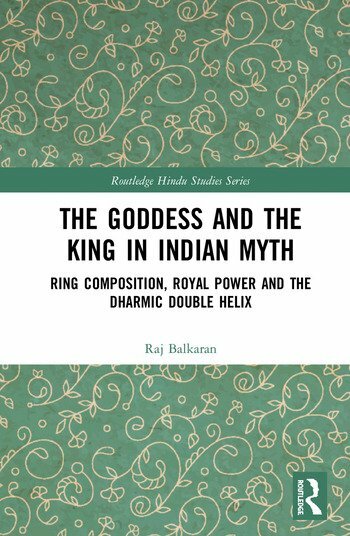 It is a centrally important early text about the Great Goddess, which has significance to the broader field of Purāṇic Studies. This book analyzes the Devī Māhātmya and argues that its frame narrative cleverly engages a dichotomy at the heart of Hinduism: the opposing ideals of asceticism and kingship. These ideals comprise two strands of what is referred to herein as the dharmic double helix. It decodes the symbolism of encounters between forest hermits and exiled kings through the lens of the dharmic double helix, demonstrating the extent to which this common narrative trope masterfully encodes the ambivalence of brāhmaṇic ideology. Engaging the tension between the moral necessity for nonviolence and the sociopolitical necessity for violence, the book deconstructs the ideological ambivalence throughout the Devī Māhātmya to demonstrate that its frame narrative invariably sheds light on its core content. Its very structure serves to emphasize a theme that prevails throughout the text, one inalienable to the rubric of the episodes themselves: sovereignty on both cosmic and mundane scales. The book sheds new light on the content of the Devī Māhātmya and contextualizes it within the framework of important debates within early Hinduism. It will be of interest to academics in the fields of Asian Religion, Hindu Studies, Goddess Studies, South Asian Studies, Narrative Studies and comparative literature. Raj Balkaran teaches at the School of Continuing Studies at the University of Toronto, Canada.